Photo and words by @newshatavakolian (Newsha Tavakolian) | In 2017, I met Fatima at the Muna camp in northeastern Nigeria. She was this fragile girl, who did not even have the chance to talk, as her brother was quick to jump in and answer my questions. I could see a certain heaviness in her eyes. Displaced by the Boko Haram, 9-year-old Fatima and her family had been living in makeshift huts in Maiduguri for 18 months. They struggled for their most basic needs, crawling into windowless huts to sleep at night. It was so hot outside that I could not breathe well as I walked through the camp area. Men, women, and children sat outside with blank gazes in their eyes, staring into the horizon, waiting for a miracle. #PressforProgress #InternationalWomensDay #IWD2018 #WomensHistoryMonth #NatGeoWomen ___________ @EmmaWatson is guest curating the @natgeo Instagram in honor of International Women’s Day. Check back throughout the day to see her sharing powerful and moving photos taken by our female photographers around the world. Photo and words by @renaeffendiphoto (Rena Effendi) | Where Mahatma Gandhi once walked his famous Salt March to protest the British rule and fight for equality, tribal women in Gujarat, India, are still weighed down by poverty. At a brick kiln they earn less than $3 a day. The brick industry is the second largest industry in India. Nearly 50% of the workforce is female, and their wages are just half of what the male workers earn. Carrying heavy loads of bricks while coated in dust, these seasonal women workers have very poor access to healthcare and are paid even less than others because of their tribal origin. In this day and age, inequality of pay still persists between women and men, as well as various ethnicities at all levels of society around the world. #PressforProgress #InternationalWomensDay #IWD2018 #WomensHistoryMonth #NatGeoWomen ___________ @EmmaWatson is guest curating the @natgeo Instagram in honor of International Women’s Day. Check back throughout the day to see her sharing powerful and moving photos taken by our female photographers around the world. Photo and words by @mishkusk (Michaela Skovranova) | This playful juvenile humpback whale was breaching just a few metres away from us. It is one of the most incredible displays of playfulness and joy I have ever witnessed. Young calves are often seen breaching and displaying similar behaviours to their mums. They play and imitate their mothers while they learn how to navigate the ocean — this learning process is crucial for their survival. On International Women’s Day, I am grateful to all the women in my life that have challenged me and lifted me up when needed. So much of my personal growth can be attributed to inspiring strong women - from completing treacherous challenges together to simply telling me to trust in my own process. I think that, throughout life, it is crucial that we keep on learning from each other and growing together. 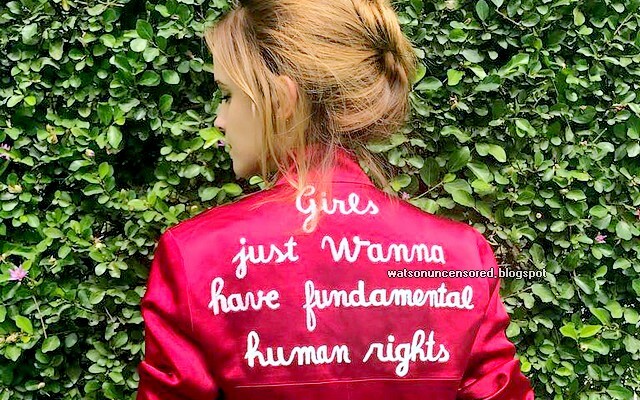 #PressforProgress #InternationalWomensDay #IWD2018 #WomensHistoryMonth #NatGeoWomen ___________ @EmmaWatson is guest curating the @natgeo Instagram in honor of International Women’s Day. Check back throughout the day to see her sharing powerful and moving photos taken by our female photographers around the world. Photo and words by @dzalcman (Daniella Zalcman) | “When I was 8, Mormons swept across Saskatchewan. So I was taken out of residential school and sent to a Mormon foster home for five years. I’ve been told I’m going to hell so many times and in so many ways. Now I’m just scared of God.” Deedee is one of 150,000 Indigenous Canadians who was forced to attend residential school — a network of coercive assimilation boarding schools funded by the Canadian government that operated until 1996. Indian agents would take children from their homes and send them to church-run institutions where they were punished for speaking their Native languages or observing Indigenous traditions, routinely sexually and physically assaulted, and in some extreme instances subjected to medical experimentation and sterilization. This multiple exposure portrait overlays Deedee's image with the grass that now covers the site where her school building once stood. For International Women's Day, I'm honored to share Deedee's story, as a reminder that as we discuss the rapid advancements that women's rights have made in recent days, that it's important to work to ensure that feminism is intersectional, and that we're trying to elevate people across a spectrum of identities. #PressforProgress #InternationalWomensDay #IWD2018 #WomensHistoryMonth #NatGeoWomen ___________ @EmmaWatson is guest curating the @natgeo Instagram in honor of International Women’s Day. Check back throughout the day to see her sharing powerful and moving photos taken by our female photographers around the world.